Saturday, March 26, 2011 Brunch at Hs' Lordship After spending 6 days in the saddle this ride was a piece of cake, and a omelet, and crab legs, and champagne . . . . you get the point. Day 4 finds us riding east into the Superstition Mountains and enjoying one of the Metro Phoenix Area's favorite motorcycling roads, the Apache Trail. The road twists and turns as it makes its way thru the mountain and around Canyon Lake before coming to the widw spot in the road named Tortilla Flats. This year we started off with a bang by covering over 10000 miles thru 3 states in 6 days. Our journey started with the customary group photo in front of the clubhouse at high noon. Those who were in attendance were members Papa, Dave, Hoa, Steve, Prospects Caroline & Ari, as well as guest rider Jeff. This year's ride calendar is almost ready. We're putting the finishing touches on it, and hope to have it published come Monday. 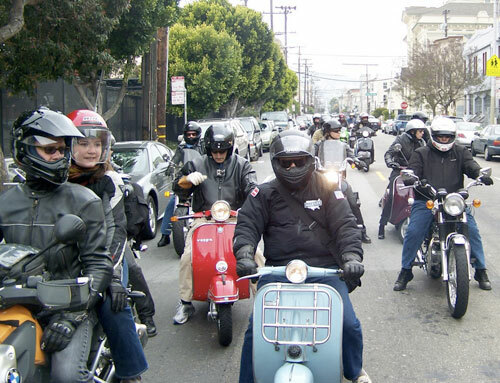 We're particularly excited about our ride to Pismo Beach with the Pasadena MC and hope you all come join us! I opened the clubhouse around 5:30, and Brian showed up shortly thereafter. Folks started to filter in, and after my patented rider meeting speech ("Don't crash, dammit. "), we had nine members, and three guests. The guests were friends of mine, and they already knew the route. After all, what kind of crazy person gets up for a ride at 6:15 if they don't even know where they are going? Since we didn't all ride out together, everyone who attended will have something to add to the story. After a terrific party last night, we all pulled ourselves out of bed early for a ride this morning. I arrived at the club at 9:30 to a full house and a stack of pancakes. We had about 50 bikes come for the ride, representing clubs like Capitol City MC and Pasadena MC. We got a little bit of a late start today, 18 bikes leaving the clubhouse at 10:30. Somehow, I wound up on Mike O's Triumph Scrambler, a gorgeous machine with a great exhaust note. At 10:45 this morning, I opened up the clubhouse. Folks filtered in, and at 11:30, the day began. The first part of the Captain's Run was a race. Well, the ride went just about perfectly. Over 80 motorcycles and 60 scooters went on the ride this year, and it was an absolute blast.